Well, Nolan is out to top all of that with an intergalactic drama that sees Matthew McConaughey heading into a wormhole to save the world. In the unspecified future, the earth is seeing its last generation. But Michael Caine (regular Nolan go-to) has concocted a plan to save humanity, and it involves sending McConaughey and a crew in search of a suitable replacement planet. As perfunctorily SciFi as that all sounds, Nolan (scripting again with his brother Jonathan) can be trusted to spare no expense, establishing the earth’s plight realistically, outlining the likely-doomed mission with little hyperbole, and basically connecting his story to science so it never feels like Armageddon II. Properly grounded, Nolan then sends us to the heavens. The balls on this guy! Wormholes, black holes, relativity, 5th dimensions, the time/space continuum – all of it handled with just enough layman’s terminology to make it palatable but not entirely understandable. It’s a trick he picked up with Inception, one of the cleverest SciFi adventures of modern cinema. 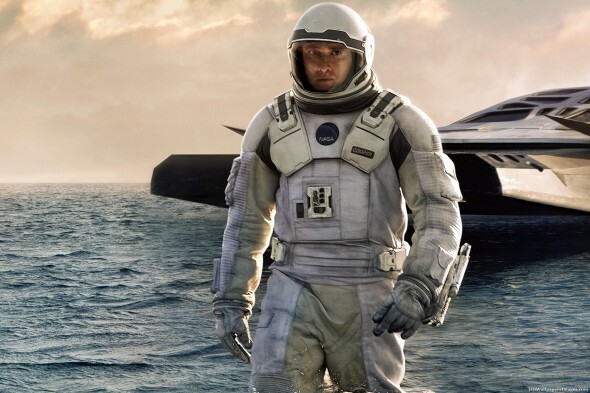 Like all galactic exercises worth their mettle, Interstellar borrows from and celebrates Kubrick, although Nolan’s film certainly never feels stale or derivative – more like the next logical step in SciFi. The sounds and silence, the mind-bending imagery, the danger and loneliness – all of it impeccably, almost overwhelmingly captured. It’s hard to watch the film without thinking of Alfonso Cuaron’s 2013 galactic masterpiece Gravity. One of that picture’s greatest strengths was its utter simplicity. Nolan is not one for simplicity, and that need to complicate has a negative impact on his effort. Earthbound entanglements lose their draw in the face of the travelers’ peril, and Nolan and his terrestrial cast can’t compel attention or interest. At home and in space, characters sometimes make unlikely yet convenient choices to further the story, which is a disappointment in a film otherwise so well crafted. It’s also quite long and it feels long, but whatever its faults, you can credit Nolan for creating a genuine epic, and an experience filled with terrified wonder.